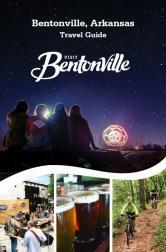 Bentonville is a place to experience morning, noon and night! From our vibrant downtown square, historical areas, and our world-class museums to our soft and hard cycling trails that connect you across Northwest Arkansas, your next adventure is awaiting in Bentonville! Bentonville is also a hub of diverse culinary options and initiatives that are paving paths to making Bentonville a top destination for food and travel lovers, alike! Creating that perfect itinerary is our job. Contact us today to start planning your trip. We look forward to welcoming you to Bentonville!